Icon is an American maker of motorcycle protective wear. They make jackets, gloves, accessories of many kinds and, of course, boots. The styling of Icon's boots is quite aggressive, often with a slight retro feel. Think Mad Max meets Steve McQueen and you won't be far off! 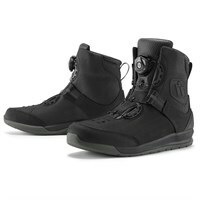 They are certainly different to the more refined and urbane style of most European boots. But they are incredibly robust; in fact, they are probably over-engineered, but it cannot be denied that they are made to last. Boots like the Elsinore and the Prep boot take their inspiration from the Southern Californian desert racing scene of the sixties and seventies. 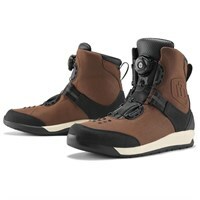 Some of Icon's short boots are particularly rugged; the El Baja even has a ski binding closure system. If tough is what you're looking for, then Icon may well be for you, but not all of their boots have a waterproof lining, so if staying dry is a priority, you may want to check out which models come with a membrane.